The pyramid four eye space (also known as four-space pyramid, farmer's hat, T-shape, T-four, shown here, is one of the standard unsettled eye spaces; whoever goes first wins. White plays at a to get three eyes and live. 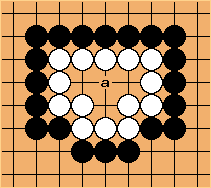 If Black plays there White is reduced to a single eye and dies. If the surrounding situation forces Black to capture, it will take him a total of four moves, after the first one at a, to do so. From Davies' Life And Death book. A Chinese term for the pyramid four is 丁四 (dīng sì). Observe how the four-space eye shape resembles the 丁 (dīng) character.